A unique and interactive show that is the perfect after dinner entertainment for corporate audiences. 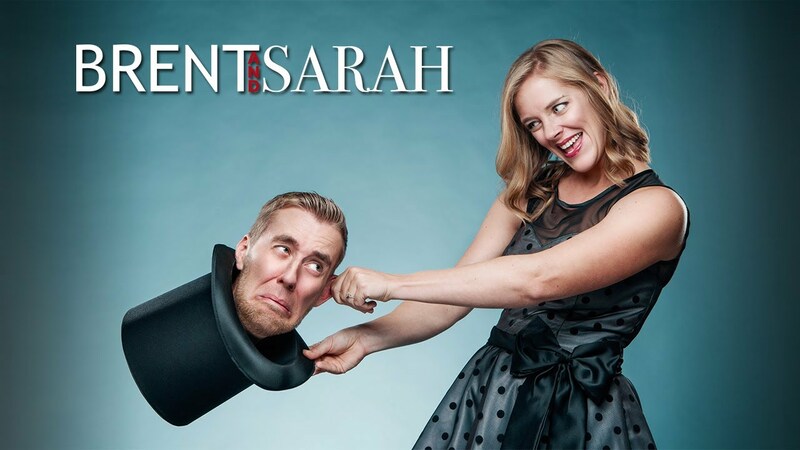 Brent and Sarah are a husband and wife duo that specialize in performing a hilarious, interactive show that audiences rave about! Watch their promo video, check out their rave reviews and contact Brent and Sarah today to make your event a 5-star success! An interactive magic show that was hilarious! Brent and Sarah performed for our wedding and we got so many positive comments from our guests. They were great at involving the crowd and really set a happy atmosphere for the whole night. Brent and Sarah were also true professionals. They communicated with us on how to make it the best show possible, showed up ahead of time to set up, and were flexible with us when we ran into delays. Would highly recommend this dynamic duo! Brent and Sarah performed at Bayview Wildwood Resort throughout the summer of 2014 and again in 2016. They were an absolute pleasure to work with and our guests gave them outstanding reviews every week. Their show is great for all ages, funny, interactive and incredibly entertaining. Keep up the great work! Brent and Sarah are absolutely amazing entertainers! Their show is packed with fast paced entertainment guaranteed to appeal to both the young and old. Be prepared to laugh. You won't be disappointed! 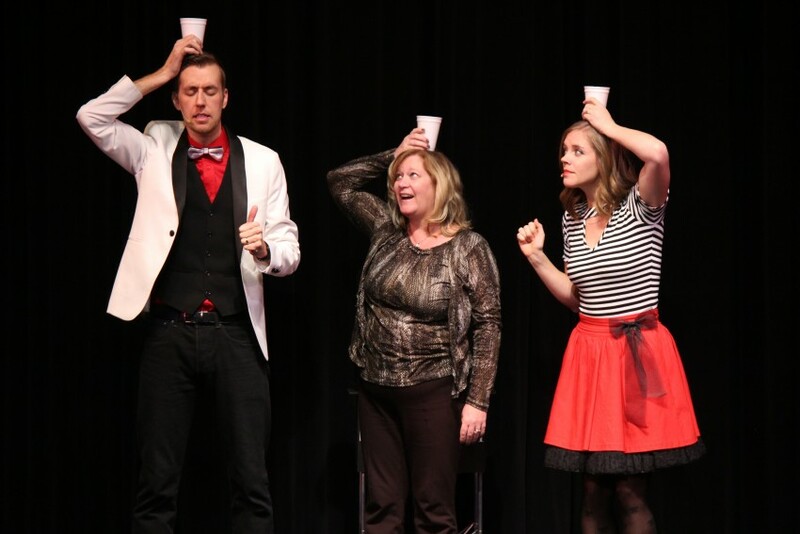 A very enjoyable show with incredible magic that the whole family can enjoy. Would recommend to any group or organization looking for a professional polished magician. IncrediBrent's performances are very interactive and keeps the kids (and parents) laughing the entire show. He has performed at several of my events and each time he performs he brings his full energy and new tricks to each show. Great show - HPL kids loved IncrediBrent! The kids and their parents loved IncrediBrent's magic and humour! We had Brent at a number of our branches for our Summer Reading Club kickoffs, and we would definitely invite him back! IncrediBrent was fantastic! He kept our crowd of about 80 children and 60 adults entertained and interested! Everyone had a great time! Very funny! The kids howled with laughter! IncrediBrent was the main attraction at my child's birthday party, which included 16 screaming 7 year old boys and girls. From the minute the show started he had them completely under control! I was amazed! Volunteers were aplenty including my child who loves the spotlight and Brent really made him feel special and like the "star" of the show. I would recommend Brent 100%. From the beginning of the process there was always clear communication right down to the details around type of space needed for set up. This level of detail was very helpful for me as I wanted the show to be the absolute best it could be. These kids are a smart bunch and generally tough critics, but Brent had them completely entertained and most of all, their cheeks hurt with laughter. It's not your old school magic show, it was witty, smart and so very funny! I would hire him again in an instant but the real proof is in the pudding and my son has not put down the "magic" wand he gave them and now has the magic "bug". Hilarious and fun! Great for a child's birthday party! IncrediBrent recently performed for my son's 5th birthday party - to a room full of 15 four and five year olds. He had them completely engaged and entertained for 45 minutes. The kids LOVED him and the adults thought he was fun and hilarious. The kids literally were squealing with delight. A great performer, and professional and very pleasant to deal with. Highly recommended. We hired IncrediBrent for my son's 7th birthday party, and he was a huge hit with the boys. His magic was hilarious and kept the kids completely engaged. He is truly a "Funny Magician", so don't expect levitations and disappearing ladies, but he was perfect for our party. He was very professional in all ways, and was well worth the money we spent! Incredibrent, Incredifun, Incredilaughs! What an entertainer, no matter what your age. The Rubber Boots Festival is pleased and excited to be able to brag that we had IncrediBrent perform at our inaugural festival. It won't be the last time, we guarantee. Watching the kids and adults clamour for a better view and hearing all the laughter was the perfect way to kick off a festival day. Beyond this I would like to also praise IncrediBrent for being a very professional as well as charming artist to work with. Miigwetch, Merci, Thank You! French River Cultural Industries Council Inc. The Kids Loved Becoming Magicians! My son attended Brent's show at a birthday party and I've never seen such excitement coming home. Not only was it a great show, the children became magicians themselves. The "magic" is something children can do and adults are left scratching their heads. The proud smile that my son has while he "performs" for us at home is irreplacable! Nathan's 4th Birthday... A huge Success! This was our 3rd time seeing Incredibrent and we were just as pleased as we were the first time we saw him. He was fun and fresh and funny for all ages. Even the parents loved his show. We first saw the show at Sherston Shores last summer and since then have recommended him for parties within our circle of friends. I couldn't have been happier with the show at our house and the price was great. Thanks again Brent and see you soon. he is very charming and he is HOT! I first saw Incredibrent perform at Fort Erie Secondary's Talent Showcase Fundraiser to raise money for the Me to We:Free the Children Brick by Brick Campaign. He was so good that my daughter wanted him for her 6th birthday party. I booked him! He was amazing not only with his magical tricks but also with how he was able to keep 30 children (Ages 2-15) and 10 adults entertained for over an hour. SheMy daughter and her friends keep asking when they can see him again! Parents and adults guests were so pleased with what they heard or saw that they were wanting his information so they could book him too. His pricing is awesome! He even travels in the Niagara Region even though he is located in Toronto. He has been booked again for the Talent Showcase at Fort Erie Secondary this May. My sister had him booked at their annual golf tournament and bbq in support of the Heart & Stroke Foundation as their entertainment and he was enjoyed by all there too. I highly recommend Incredibrent for any occasion small or large you may have. He is worth every cent! I have seen and booked other entertainer for various occasions and he has definitely been one of the best! Brent was very entertaining and had the children laughing and yelling. The kids loved him!! Very professional and personable. Found his fee a bit pricey but I did not shop around and price out other entertainers. I would absolutely recommend and hire him again for future parties. My 5 year old daughter's birthday. Incredibrent was really great. We had 12 children attend my daughter's 5th birthday party and before Brent walked in we were worried if we'd be able to keep everyone interested the group was a mix of mostly girls and a couple of boys well he captivated this audience right from the get go. The kids kept their eyes glued to Brent and participated in every trick. Well done Brent!! Awesome job. I highly recommend your performance to parent looking for a fun way to keep the kids happy and laughing for the duration of almost an hour!! We had Brent for a party for five year olds. It was great magic and a professional show - Brent's a wonderful entertainer. The kids were fully engaged and laughed as hard as the adults did. We would certainly have him back. Awesome 3 and 6 year old combo party! Incredibrent truly did the incredible: he kept 20 kids - from the ages of 3-6 interested for 45 minutes! Brent was awesome; his act was funny and exciting, and the kids truly loved him! The parents too! Thanks Incredibrent! We had Incredibrent Entertain our guests for my son's 1st birthday party and everyone, both young and old loved the show! We didn't know what to expect and were worried that the show wouldn't meet our standards but the show was nothing short of spectacular!! People and kids were amazed at the tricks and I could've sworn some of the kids almost laughed their heads off! They laughed so much that some of them couldn't breathe !! Incredibrent, You should be proud to know you are great at what you do wand it looks like you really enjoy it so that's all the more better! Good luck and we will definitely keep you in mind for future parties and will highly recommend you! Incredibrent you are an amazing magician and a wonderful entertainer. Your patience and professionalism just moved us. All the kids and adults had a really great time and enjoyed your show. Thanks again for coming out and supporting Desi moms to raise money for SickKids Foundation. We will definitely work together in future. Keep up the good work. Booking Incredibrent is a MUST!! Great show for kids and adults!! He kept the kids laughing with his magic, and best of all - it was an interactive show! all the kids felt special!!! I would book Brent again for any event!!! Brent did a great show for our son's 1st birthday. He was interactive and made it fun for the audience which varied in age from 1 year old to 14 year olds, and adults included too...that is a tough job!! GREAT TRICKS, Thanks for an incredible show. During Brent's performance, Brent had the kids laughing and the adults entertained too. He was very punctual and professional. Thanks to Incredibrent, my daughter's 7th birthday was a hit. Brent had 14 little girls (and the adults) engrossed in his performance throughout! Amazing, Best Performer I've seen!!! I had Incredibrent come perform for my daughters 5th birthday party with about 10 of her friends and all our family she had so much fun and the kids all loved it. He went above and beyond my expectations, i was so impressed! The kids loved it, the adults loved it, my daughter had so much fun, it was the highlight of the party. A week later i am still getting comments about how great the party was and how much everyone loved the magic show! He was great. I have already booked him for next year, too great not to do again!! Brent we cannot thank you enough for making our son's B'day party not only a great success but also a memorable event. The way you entertained the kids was funny, spontaneous and very clean. What we also appreciate is the fun interaction you had with the group and also making sure that you involved each and every child. IncrediBrent was Incredible! All the kids and adults enjoyed the show. I would highly recommend IncrediBrent and have already referred him to friends and family. You won't be disappointed! We hired Brent to entertain 20 kids at our New Year's Eve party and he did such a great job that half the adults were watching his show too! The kids had a great time giggling and enjoying Brent's magic show. He was great at engaging the kids and clearly has a great sense of humour and fun. We would hire him again in a second for any party and highly recommend him - in fact, several parents asked for his contact information. Incredibrent had all the guest's at my daughter's birthday party in tears with laughter. What a wonderful mix of magic and comedy! Brent's magical personality won over birthday party guests! We recently had Incredibrent perform for my son's 9th birthday party. His show was amazing and had all of the qualities you look for in an entertainer...he was fun, entertaining and funny, not only for the kids but the adults as well. He appropriately involved the birthday boy and some of his friends and taught them some magic at the end of the show. I highly recommend Incredibrent for your next event!!!!! Brent and Sarah Nicholls are a husband and wife team of magicians who travel North America with their one-of-a-kind show. 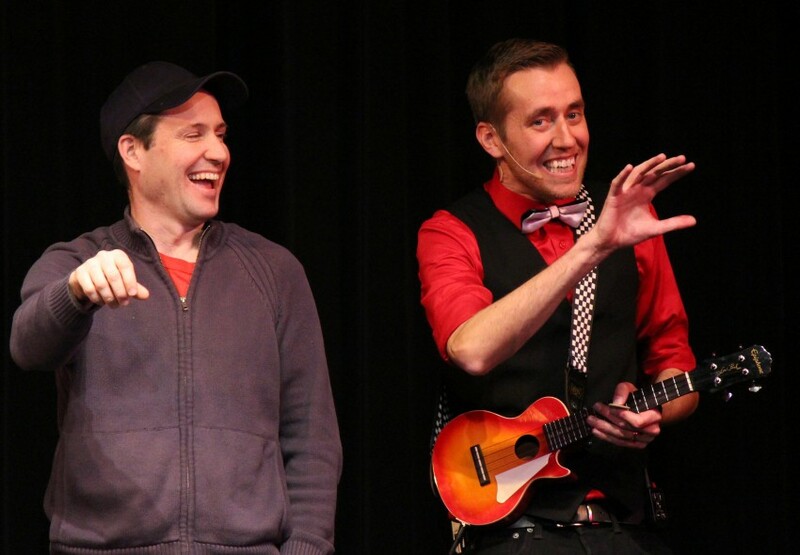 Their unique and hilarious approach to magic has made them a trusted choice for audiences of all shapes and sizes. 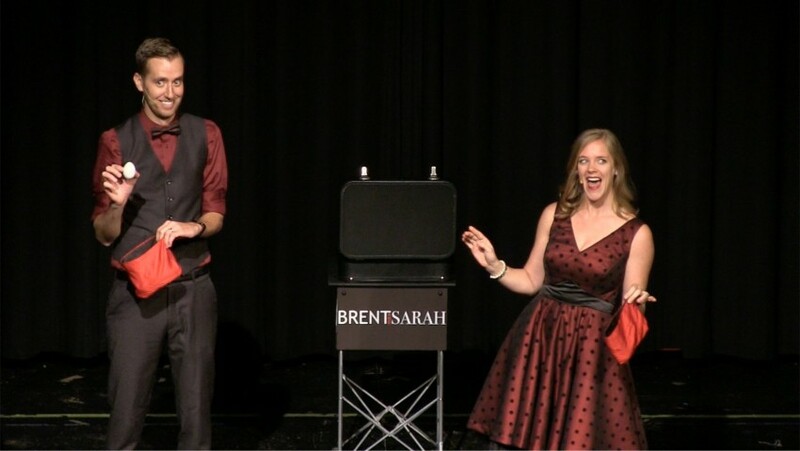 Unlike a traditional male magician and female assistant, Brent and Sarah are a unique husband and wife team with a style all their own. 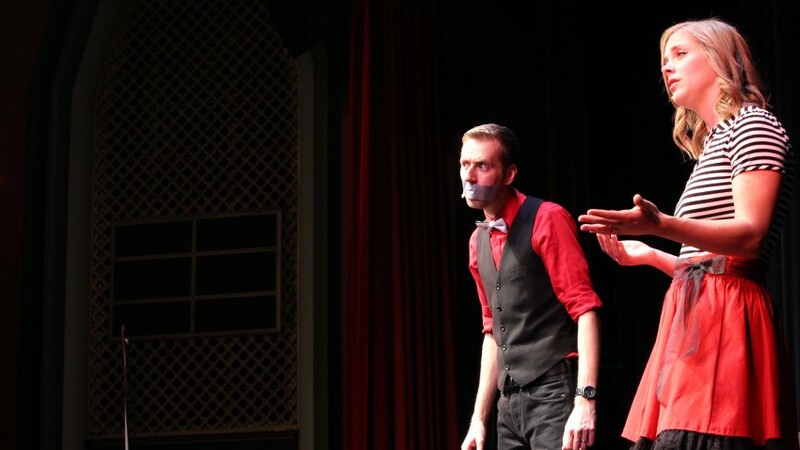 Together they combine magic, comedy, live music, improvisation and interactive audience participation into every show they perform. Brent and Sarah live in Toronto, but they first met while performing aboard Disney Cruise Line. With their big personalities and magical talents they entertained thousands of guests week after week. During their time with Disney they were trained by some of the best minds in entertainment and together they crafted a high energy show like no other. After 3 full years of travelling and performing on the high seas Brent and Sarah got married and moved back to Canada to start the rest of their magical life together. Today, Brent and Sarah perform hundreds of shows every year. They are based out of Toronto, but are available to entertain world wide. Their interactive show awaits any audience members that don't mind watching from the edge of their seat!